Crowns are a popular dental procedure in Wesley Chapel that many oral health care professionals recommend to patients to correct a number of imperfections and conditions in the mouth. 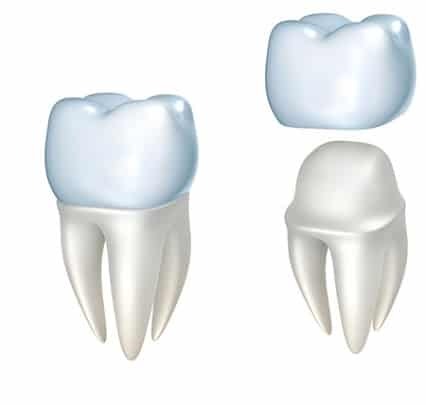 Dental crowns can be used in both restorative dentistry procedures as well as for cosmetic purposes. For example, crowns are an excellent choice for patients who have a weak or damaged tooth that requires reinforcement to a bridge, a tooth that is extremely discolored or cracked, or even a misshapen or crooked tooth. Dental crowns can be made from a variety of materials. Our dedicated team at Advanced Dental Arts in Wesley Chapel, Florida, works closely with each and every patient to ensure we select the best treatment option for you. Full porcelain fused to metal. Full cast gold crown. The process of dental crowns typically requires two to three dental visits, during which a mold will be made of the tooth being crowned. 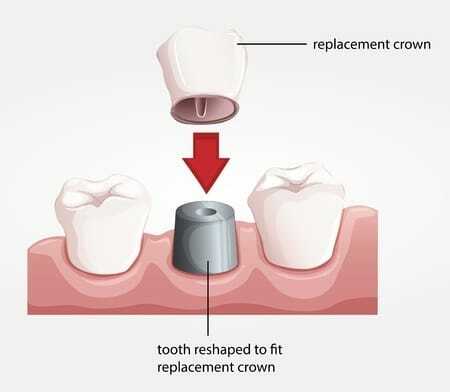 Your teeth may need to be filled or filed down depending on your individual needs, and then you will be fitted with a temporary crown while the permanent one is being made to fit your unique tooth structure. Once the permanent crowns have been placed, they may take some time getting used to. However, after you become accustomed to the way they feel and look in your mouth, you will barely be able to notice them! Crowns are intended to function just like a normal tooth, allowing you to comfortably eat, talk, smile, and drink without experiencing any discomfort.